Add water into a pan, add turmeric and boil. Add noodles once boiled. Strain water when noodles are soft. Fry boiled noodles in heated oil. Add water, salt, whole cumin and 2 spoons of oil into a pan and boil. Once boiled, add rice and boil again. 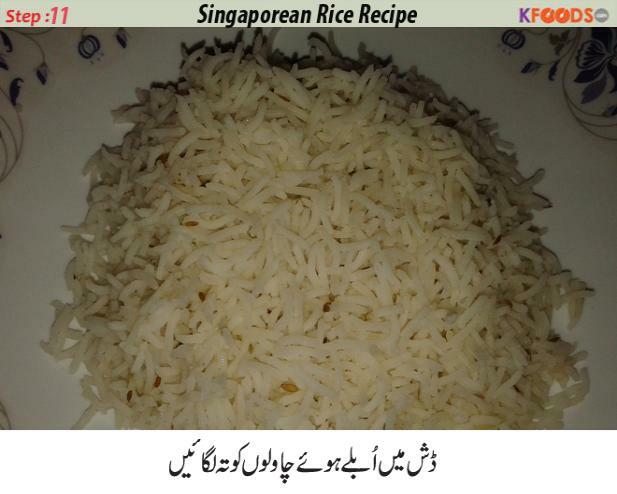 When rice are cooked, remove the water and steam-cook boiled rice (dam pe rakh den). Cut green chillies into elongated pieces, cut garlic into thin chunks and slightly fry in heat oil. Cut onions, capsicum, carrot and cabbage into cubes. Cook ginger garlic paste in hot oil, add chicken and cook until it turns light brown in color. Add all cubed vegetables and mix well. Add white pepper, black pepper, salt, oyster sauce and tomato ketchup. Mix corn flour into water and add to the pan. Mix mayonnaise, water and crushed red chilli in a bowl. Lay a layer of boiled rice in the dish. Now lay chicken and vegetable mixture over the rice. Then add mayonnaise paste, fried chillies and garlic. Put noodles over it. 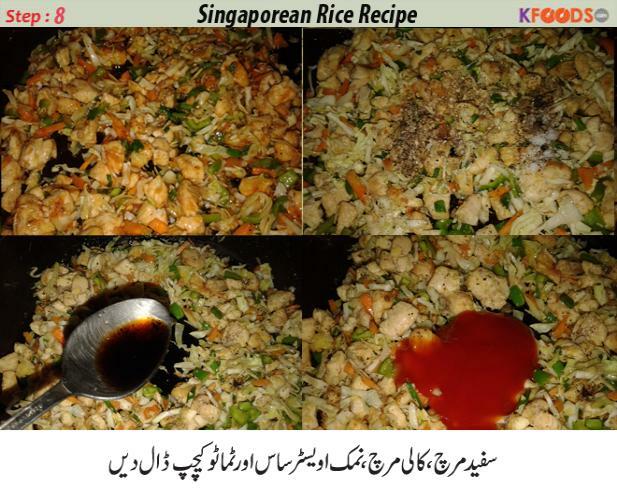 Delicious Singaporean rice are ready to enjoy. Add water to a boiling pan, add turmeric and let the water boil. Add noodles when boiled and boil more. Once noodles are soft, sift the water, and fry boiled noodles in hot oil. Add water, salt and whole cumin to water and boil. Also add 2 spoons of oil. Add rice once boil and then boil the rice. Cut green chillies length-wise, cut garlic in elongated pieces and lightly fry in heated oil. Now cut onion, capsicum, carrot and cabbage into small pieces. Roast ginger garlic paste in hot oil, add chicken and cook until lightly browned. Add all vegetables and mix well. Dissolve corn flour in some water and add this solution to the pan. Mix well. Add sauce to make it thick. Now combine mayonnaise, water and crushed red chillies and mix well. Make a layer of boiled rice in the dish, then spread chicken and vegetables mixture. Then spread a layer of mayonnaise mixture, fried chillies and garlic. Tasteful Singaporean rice are ready to serve. Enjoy! 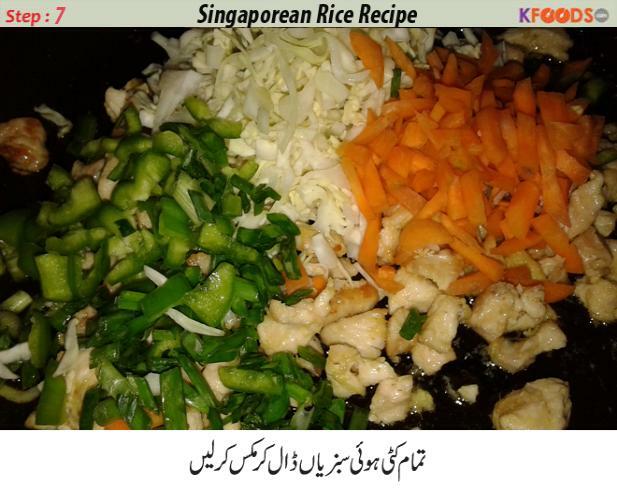 Singaporean rice recipe can't be even easier than the method presented here! 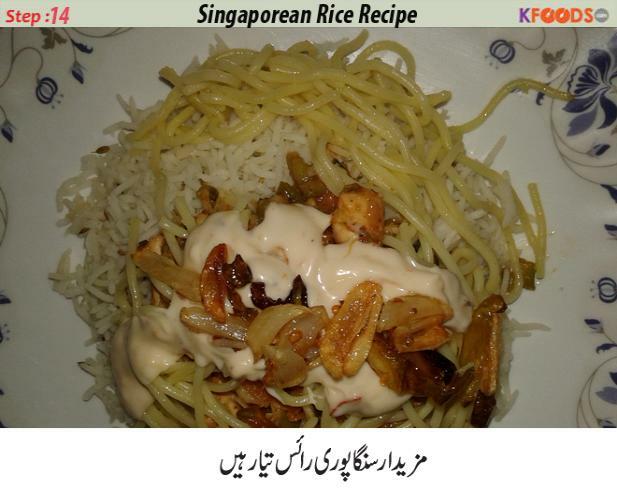 See how to make a perfect Singapore rice dish in Urdu with step by step pictorial recipe by KFoods.com. You may have enjoyed Singaporean rice before at a restaurant. If yes, then I bet you have not forgotten the taste of this beauty recipe. You must have wished to eat it again. 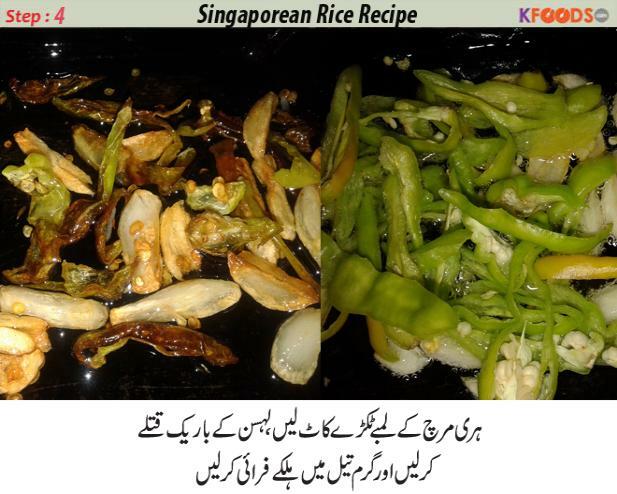 So here is the recipe by KFoods, follow each step one by one and feed that eager foodie inside you. 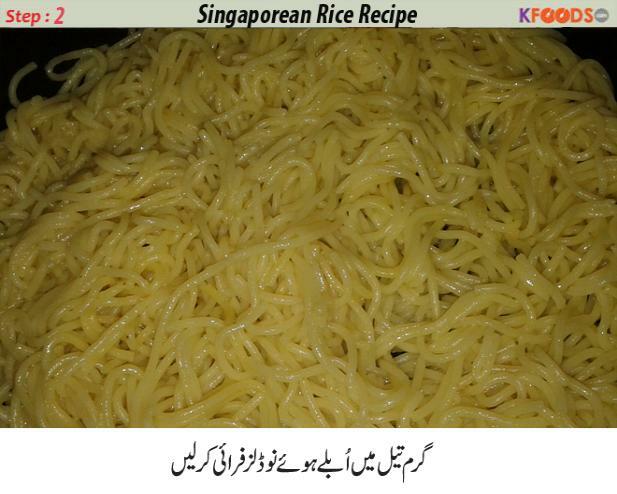 Here is the step by step recipe for Singaporean noodles rice. 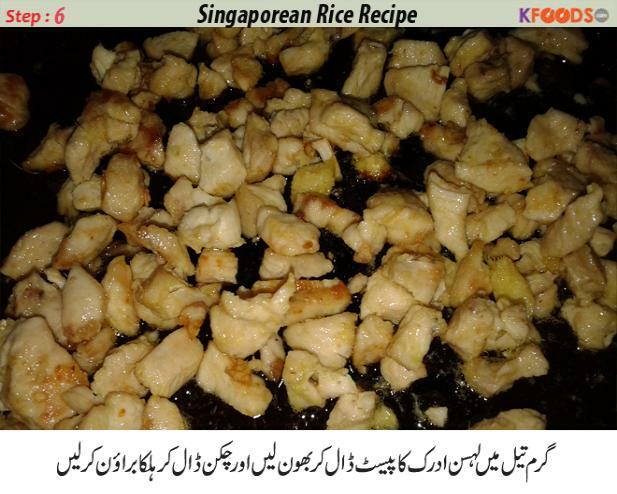 I love Singaporean dishes especially Singaporean rice recipe is the best one in all foods. I eat and enjoy myself. keep me busy making them for my family. Singaporean rice is my favorite International cuisines of them all because it contains a lot of ingredients which are beneficial for you and incredibly tasty! 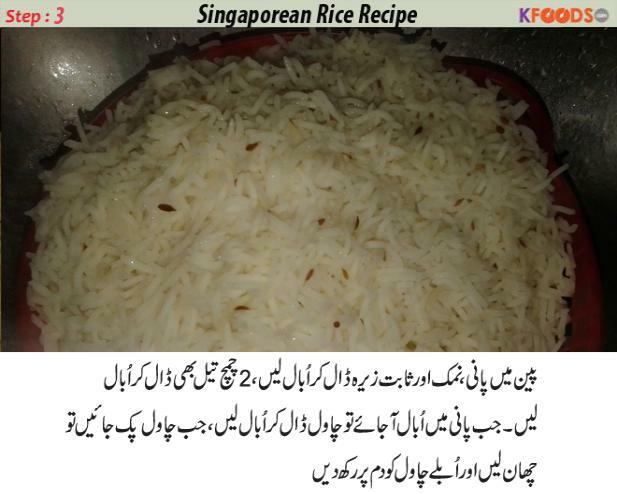 Singaporean rice recipe is something that I will recommend to every one! I primed it for my kids. All of them liked it so much that they finished it no time and even they were asking for more after finishing it. It was really marvelous in the taste. 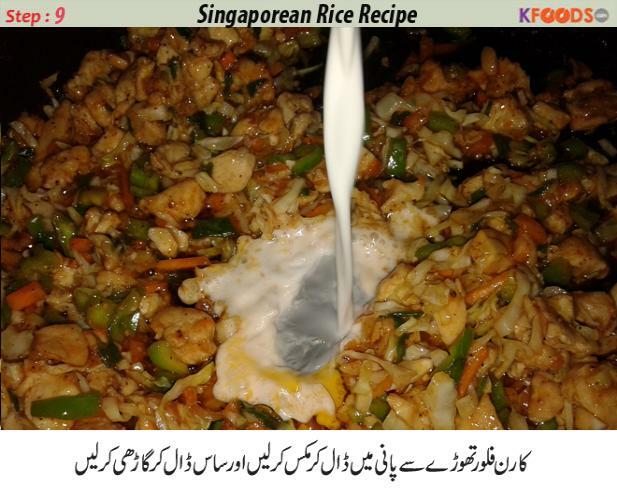 I really like this Singaporean rice because its light taste attracts me to eat it again and again which I make it by following this recipe who makes with the delicious and light taste I specially thankful to kfoods. I always find this very helpful for me and same is the case with this recipe as well. I was supposed to make Singaporean rice for today’s lunch and I did so with the help of your recipe.thanks a lot. 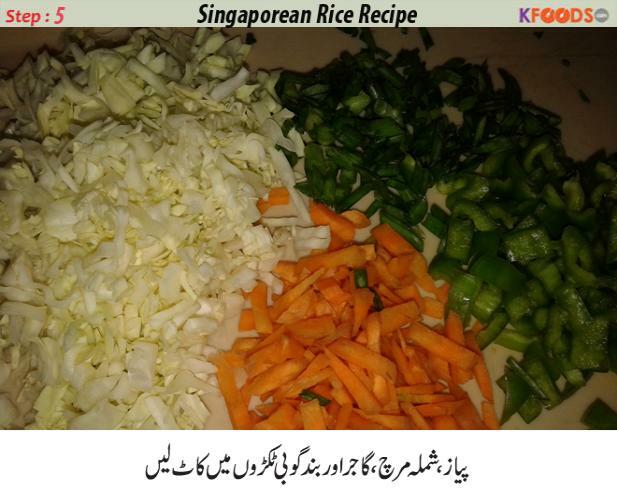 I prepared these Singaporean rice for my children. They were enjoying its incredible and yummy taste a lot. Please share the recipe of making Russian pasta as the Ramadan is here and everybody at home wants to eat new and innovative dish in the iftar. It seemed very difficult to make Singaporean rice before the day I tried it myself. I once tried and then it becomes an easy one for me. It is very tasty and on the demand of my home members, I make it frequently. You have made me think that Singaporean rice is literally good for making lunch. I mean it was totally above my expectation that it tasted too good. I was happy to eat such a yummy food. In my hostel, we all friends made Singaporean rice and all of the girls including my warden of the hostel enjoyed it a lot. All of them were happy to see my efforts and they appreciated me a lot. I always find this very helpful for me and same is the case with this recipe as well. I was supposed to make Singaporean rice for today’s lunch and I did so with the help of your recipe. 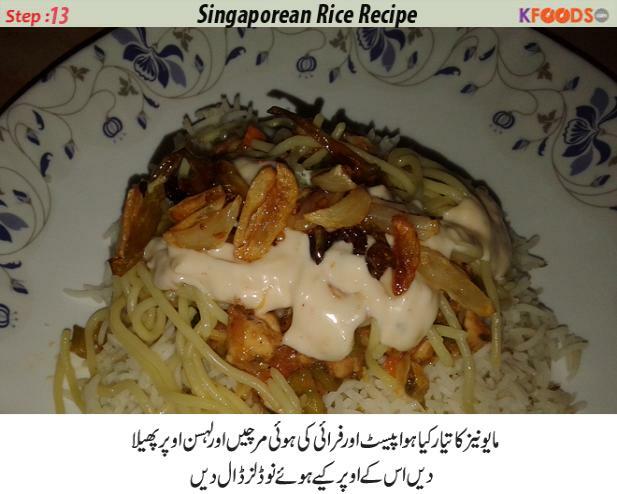 Singaporean rice is very delicious and tasty dish for eating. Your recipes are very easy to make and they have made me a good chef. Everyone loves it in my house. We live in hostel so we arranged one dish party in the hostel on which I cooked Singaporean rice. All my friends liked it so very much. Thank you very much for the recipe. These Singaporean rice were cooked for my family by me and all of them adored it a lot. I must appreciate your efforts to make this website more helpful and easy for the user like me. one should never stay stick to one dish but they should always make new dishes. And try new things. Its so boring when you keepon repeating things. 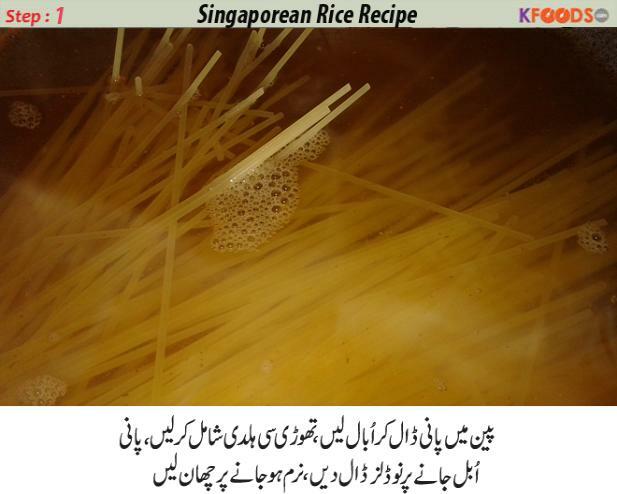 Singaporean rice…………..Must be tried by all the mothers in order to provide their kids with the best hygienic food made at home. Please share some more foods for making my kids happy. I love to eat rice.Now I learn to cook a different kind of rice.This web site variety of recipes helps me to learn more and more. I am very zealous to cook foods especially continental foods from Chinese and Thai cuisines. I also like this Singaporean rice because whenever I have eaten it at a restaurant, it was always very tasty. I made it for my friends and took them to the university, everyone there in the university liked it so much, even my teachers as well. They were happy that I made rice for them. I made this recipe for my friends and took this to the university for them. Everyone from my friend circle ate it and liked it very much. I am very grateful to you for this fabulous recipe. 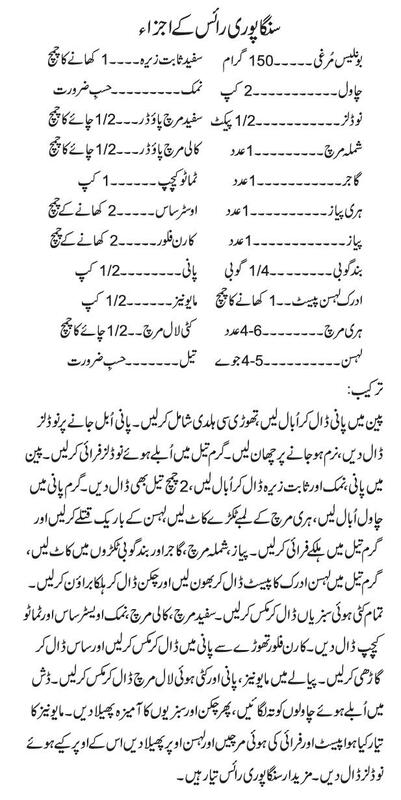 Hi, please share this recipe in English. It is my favorite ever rice but I need to get all instructions and steps given in English. I have eaten this rice at restaurants but yet I could not enjoy this at home. Once I get the recipe in English, I will make it myself. I made these rice for my children. All of them were so happy to eat it. I am so grateful to you for this amazing recipe that made my kids happy. Thank you. I liked the recipe very much as it is very easy to cook. It is an instant way to remove your appetite. I made it for my kids and they said mom you are so great. Their complimentary remarks made me happy. I made these kababs for my kids ad they really liked it a lot. They were so happy to eat it. Please share some more recipes that can easily be made for my kids. Thanks. I made these rice for my little cute daughter who is in 2nd standard. She really liked it very much. I am very grateful to you for the delicious and mouthwatering recipe. Singaporean rice is my favorite. I must eat it once a week. 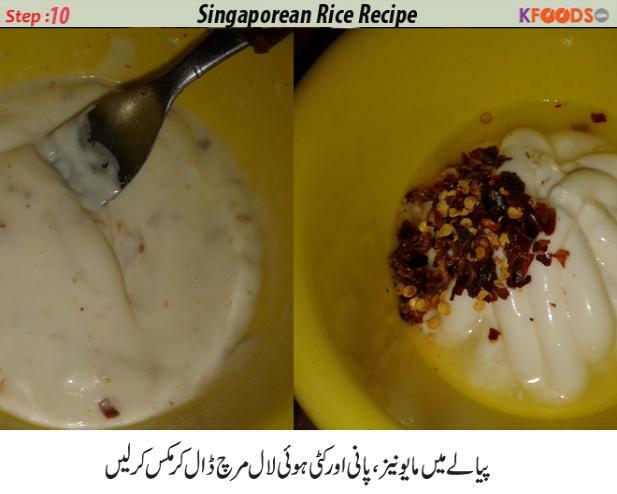 Read Blog about Singaporean Rice Recipe and health & fitness, step by step recipes, Beauty & skin care and other related topics with sample homemade solution. Here is variety of health benefits, home-based natural remedies. 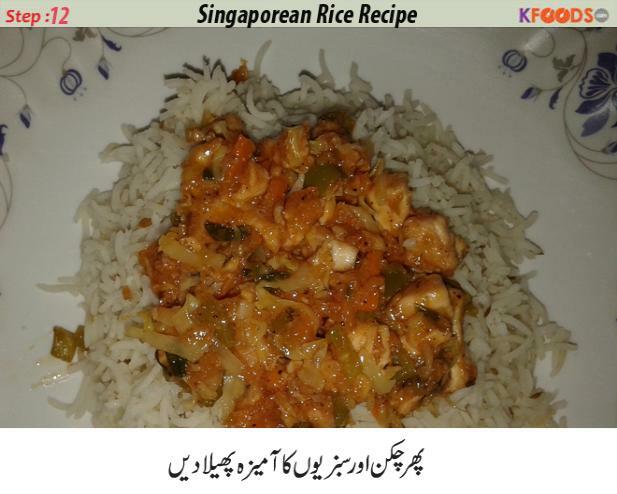 Find (Singaporean Rice Recipe) and how to utilize other natural ingredients to cure diseases, easy recipes, and other information related to food from KFoods.